SEBRING, Ohio - A small Ohio town about halfway between Canton and Youngstown is facing a growing drinking water crisis like the one in Flint, Michigan, that has captured national attention. The water treatment operator in Sebring, Ohio, is facing a criminal investigation from the Ohio Environmental Protection agency after elevated levels of lead and copper were found in tap water, reports CBS affiliate WKBN in Youngstown. Schools have been shut, and Sebring's city manager issued an advisory Thursday night that said children and pregnant women shouldn't drink the village system's tap water after seven of 20 homes where the water is routinely tested showed levels of lead and copper that exceeded U.S. Environmental Protection Agency standards. On Sunday, the Ohio EPA said it is taking steps to revoke the license of James Bates, Sebring's Water Superintendent. They say they have reason to suspect Bates falsified reports, according to WKBN. The agency claims that Bates "is not properly performing his duties in a manner that is protective of public health." "The games the Village of Sebring was playing by giving us incomplete data time and time again, and not submitting the required documents, made it difficult for our field office to determine whether or not they had notified their customers," said Heidi Griesmer, an Ohio EPA representative. Bates declined a request to comment from WKBN. Despite the investigation, Ohio Environmental Protection Agency spokesman James Lee told WFMJ-TV in Youngstown that the lead is not coming from the Sebring water treatment plant or the Mahoning River, where the village's system gets its water. Lee said the agency believes the traces of lead and copper are coming from smaller distribution lines and possibly old homes with lead pipes. "We are working with Sebring water treatment plant to make adjustments to minimize leaching of lead into the water," he said. The school district canceled its Monday classes as more tests are being done on its tap water. Sebring Schools Superintendent Toni Viscounte said in an email Sunday the district will be closed on Monday. "Another round of testing is being done for precautionary reasons." Tests had showed lead levels at 21 parts per billion in the seven homes. The EPA standard is 15 parts per billion. Lead can cause serious health problems for infants and young children. The Sebring water system serves around 8,100 customers in the Mahoning County communities of Sebring, Beloit and Maple Ridge. Sebring is about 60 miles southeast of Cleveland. Classes had been canceled Friday for the Sebring school district's 650 students as a precaution. Viscounte said the career center students will have school on Monday and the junior high basketball game will still go on. Bottled water and hand sanitizer will be given out, he added. A posting on the district's website on Sunday morning had said the schools' water was safe and classes would resume Monday. The post was later removed and updated with one that classes were canceled "due to additional testing that the EPA has requested." 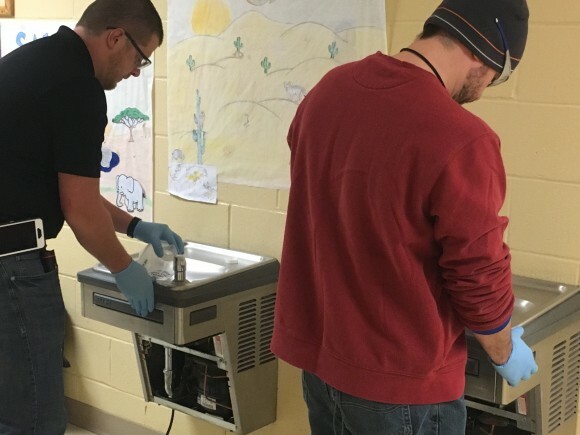 The schools' website said initial water testing was done by taking samples from a few areas in the school buildings, but tests have been requested for all water outlets in both buildings. Volunteers handed out bottled water to residents over the weekend. "Our primary focus is to distribute this water to pregnant women, infants and children," said Mahoning Emergency Management Agency Director Dennis O'Hara. "That is our primary focus. We are not going to turn anyone away, but we want to make sure we are hitting our target population that is most at risk according to Centers for Disease Control guidelines." A blood lead screening clinic was held Sunday for area residents under age 6, along with pregnant or breastfeeding women who get their water from the village.